Nobody learns a programming language just to brag about writing loops. Instead, languages exist so you can create great software. That's the purpose of Start-to-Finish Visual Basic 2015, to show you how to write a complete, useful, working application in Visual Basic and .NET. Whether you're new to programming, or want to add Visual Basic to your existing skillset, Start-to-Finish Visual Basic 2015 will guide you step-by-step through the learning process. 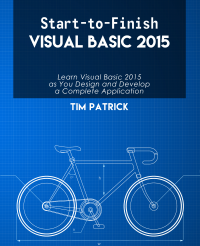 This great Visual Basic 2015 learning tool is now available for purchase in paperback and ebook formats. The Library Project designed in Start-to-Finish Visual Basic 2015 uses a barcode font supplied by you to print barcode labels. The following is a list of some resources you can use to locate a barcode font. Visit the errata page for this book to see a list of corrections that were identified after the book went to print.